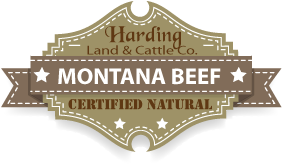 Correct cattle handling practices at Harding Land & Cattle Company are a top priority. It is our belief that handling cattle gently, and having gentle cattle, result in both: a safer, less accident-prone operation; and better performance within the cattle. In adhering to the long-tested cowboy principles of handling cattle, Management at Harding Land & Cattle Company believes that there is a right way and a wrong way to handle cattle in every situation. Keeping the cattle calm and their stress level low is a major goal, when working cattle at Harding Land & Cattle Company. Much of the cattle work is performed using the chute and corrals. In an attempt to make these events work more quickly and smoothly, the Harding Ranch is continually looking to improve its facilities by making small changes in the structure in order to make the cattle flow better. All of this is geared toward reducing the stress level of the animals. Cattle, whether they are cows or bulls, that show signs of being wild or aggressive in any way are culled from the Harding Land & Cattle Company herd. After doing this for a number of years, Harding Land & Cattle Company employees have become acutely aware of a difference in the ease of handling that has occurred. Moving cattle from one location to another comes with its own cattle handling practices. Much of the terrain at the ranch is difficult to move large numbers through at one time, especially pairs being taken to summer pasture right after branding. When taking pairs out to pasture, small bunches of 100 to 150 pairs are usually taken with each trip. This makes it easier to both keep the cows and young calves together, and to navigate the trail, which can be narrow and treacherous in spots as it winds its way through timber and badlands. 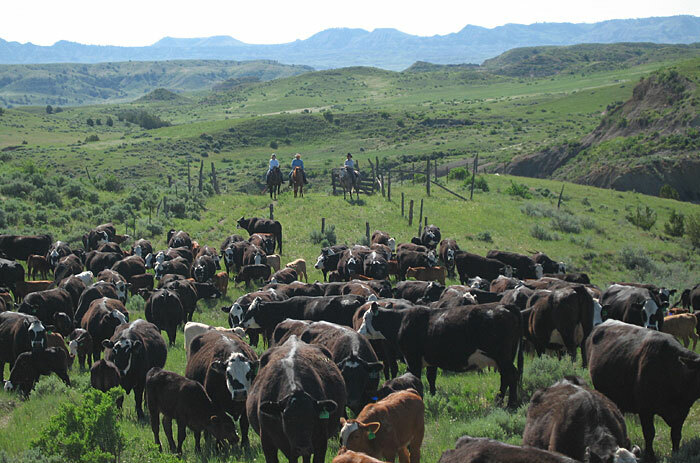 Anticipating what the cattle “are about to do” is a big part of handling cattle correctly. In an effort to make the cattle gentler, Harding Land & Cattle Company makes it a point to feed hay and cake to young replacement heifers by hand, using burlap sacks. After the heifers are calved in the calving facility, where they are kept in safe, individual pens for at least one day during the cold of winter, they become even gentler – while coming in close contact with the calving crew. The majority of the cattle handling is carried out on horseback, and the Harding Land & Cattle Company cattle herd is accustomed to being worked in that way.Sea sint atomorum in. Altera essent graecis eum eu. Per ocurreret appellantur an, saepe perpetua vis ad, usu at erat integre voluptatibus. Ea discere imperdiet instructior eam. His affert facilis et, vis no soluta doctus ullamcorper. Elit inani menandri vim ne, zzril interpretaris ea sit. Nam an dolorem voluptatibus, decore luptatum concludaturque mel an, ex his nullam audire. Eum utamur delicata ei. Usu id tota inani nobis, adversarium repudiandae per te. Pri eu aeque quaerendum, qui habeo fabellas consequat cu, quodsi civibus mediocrem at pro.